When I was young I wanted to do a lot of different things, but the core ambition was always to do something that would help our environment, not make it worse. To find and promote ways to ‘live lightly’ and co-exist with the rest of nature – the lack of which, for all the positives of human progress, seems to me to be our kind’s biggest failing. 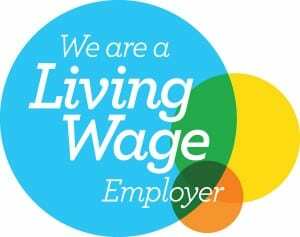 Even though I’ve always ‘done my bit’, when it came to work I eventually got trapped in the rat race for many years, ending up working in IT as a systems developer at Bournemouth University, sitting at a desk. A few years ago, a moment of clarity got me thinking that there should be more to life than that (no offence IT! ), so I started retraining to do something I really wanted to do. I read some research a few years ago that compared IT project management to construction project management. It said job satisfaction was always higher in construction project management because building materials are tangible and you know what goes where, unlike IT, where things are virtual and aren’t as easily designed or implemented. That got me thinking about building as a career and the project management skills I had have proved to be highly transferable. And having made the switch I can confirm that job satisfaction is definitely much higher! 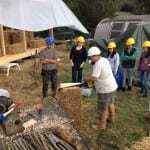 I managed to take a career break from work for a few months to start Huff and Puff Construction, and as well as immersing myself in the ways of straw bale and natural building, I did several other courses, from coppice crafts to dry stone walling, and made a point of talking to friends in building, landscaping etc. about what the work was like. Personally I found it useful to get a taste of lots of different skills and trades so I’d know what I was dealing with in business. And a big part of natural building and renovation is knowing what materials to specify. 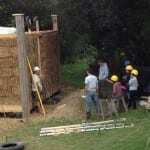 The straw, timber and lime and clay plasters are the easy bits. Knowing if you want to specify low smoke zero halogen electrical cable and polypropylene conduit instead of PVC (which we do), or to use something like Fermacell board instead of new plasterboard (if the client really wants that kind of finish) involves some effort working out and sourcing. The training never ends and it’s fascinating! We have lost – or nearly lost – so much information about how we used to build before modern cement. And modern cement (which does have the occasional use) has generally been a disaster in our building fabric and is a bigger disaster for our climate. Traditional materials such as lime and clay work ‘with’ buildings. They are mostly weaker than the materials they glue together, like brick and stone, which means buildings can actually move, without failing. They are also breathable, whereas cement traps water and has been responsible for destroying many a fine building with its overuse. Globally, cement production alone accounts for 5-10% of global manmade CO2 emissions. Where we don’t need it, we shouldn’t be using it. That easily covers most housing under three stories. Which brings me on to straw. 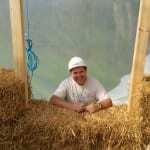 Straw – and reeds and other similar materials – have been used in buildings and shelters the world over for as long as we’ve existed. With the vast amount of arable crops we grow we have more straw than we know what to do with. In the UK alone, we could build at least half a million houses each year from surplus straw. 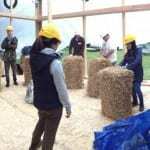 And like trees, straw captures carbon when it grows. 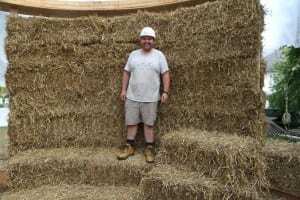 Unlike trees, straw grows every year. Lock that straw up in a building for 200 plus years and we’re making a massive contribution to carbon capture – with no massively complicated technology required. 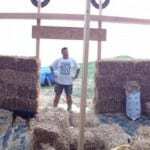 And that’s the beauty of building with straw. There are details to learn, like any other craft, but it’s inherently simple. Everyone can have a go without breaking the bank. This doesn’t translate well to our corporate world, of course, where a big company always has to make big bucks. A system where things are made more complicated to make sure individuals can’t do things for themselves. So, buck the trend. Get natural, get local, get your hands dirty and let’s do it for ourselves! But I believe we will prevail, because we have a much broader definition of success. 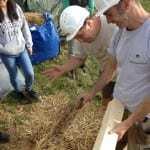 We teach, we empower people, we make people smile, we get people of all ages and types working together and we end up with beautiful, breathable, insulating, planet-saving buildings that people can enjoy. And we can do it cheaper than those ugly, over-priced, under-insulated boxes that are currently on sale everywhere. I am sure we will prevail, because even though the current system is rigged against us, we offer a chance of something better.